Issued in 2006, "Morro Bay (Images of America)" by Roger Castle and Gary Ream of The Historical Society of Morro Bay, is a very welcome addition to the limited printed information available about the history Morro Bay, CA, a California central coast treasure. 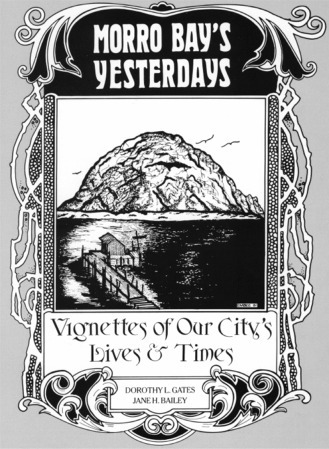 This is a must-have volume for local residents and others interested in Morro Bay history, along with the earlier classic 1982 "Morro Bay's yesterdays: Vignettes of our city's lives & times" by Dorothy Gates and Jane Bailey. Both books provide extensive historical photos not available elsewhere. 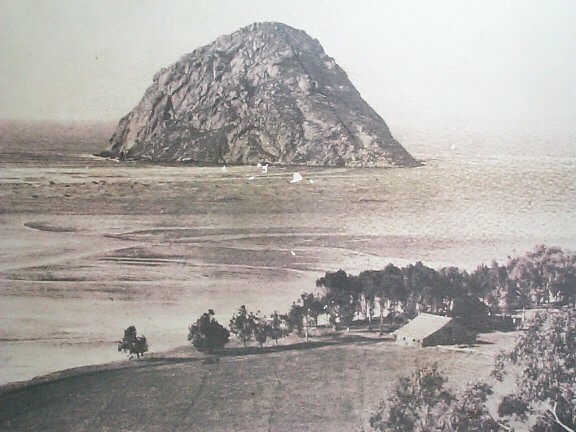 "Morro Rock, the ancient landmark towering 576 feet above the entrance to Morro Bay, was named by Juan Rodriguez Cabrillo during his voyage of discovery up the California coast in 1542. 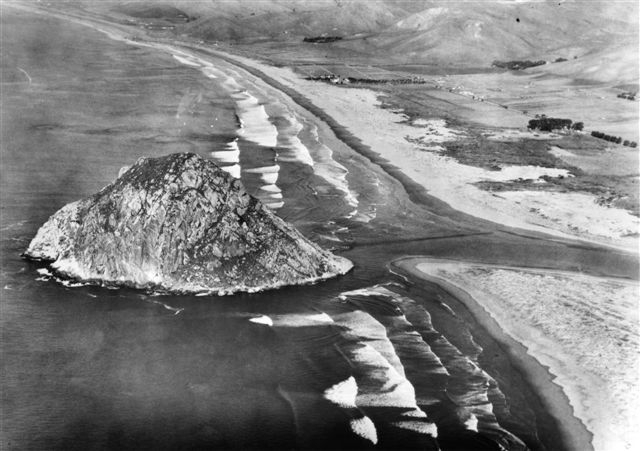 The last in a chain of long-extinct volcanoes, Morro Rock soon became a landfall for Spanish galleons sailing the coastal waters. 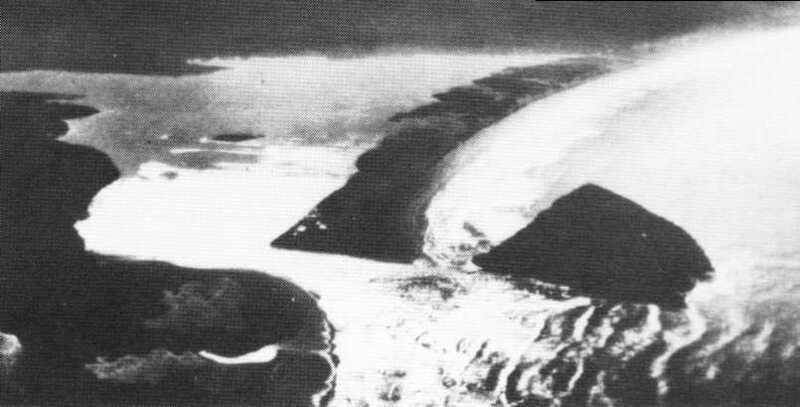 The captain of one of those vessels, Pedro de Unamuno, put into Morro Bay [see contest below] in 1587, claiming the land for Spain. 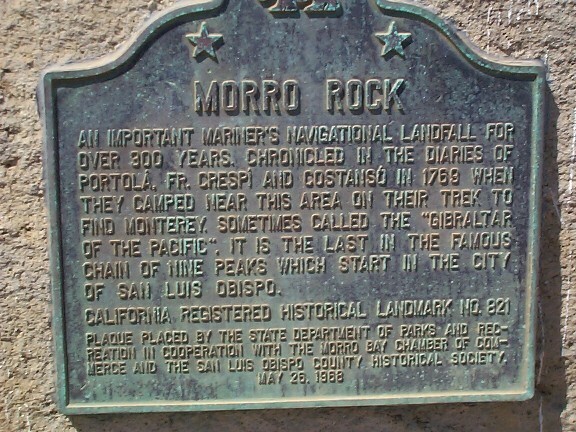 Don Gaspar de Portola and his party camped near the rock during their march to Monterey, and a page from his journal of 1769 notes the rock was an island at high tide, "a little less than a gunshot" from shore." Henry R. Wagners Spanish Voyages to the Northwest Coast of America in the Sixteenth Century (California Historical Society, San Francisco, 1929) reportedly includes an English translation of Unamunos account of his travels. 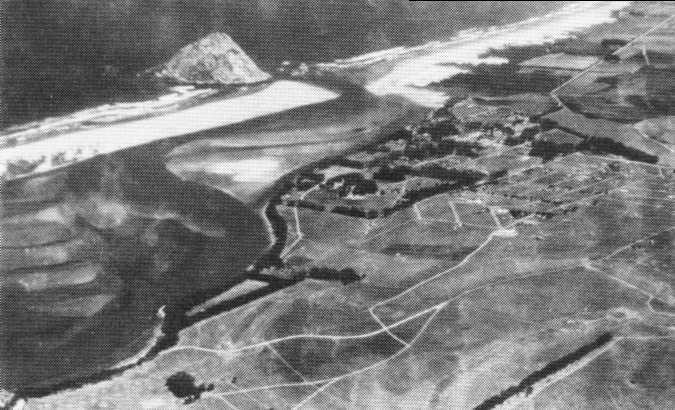 (this interesting article questions the accuracy of the above widely repeated general claim more (specific) of a "1587 first landing" in Morro Bay) Related plaque at Morro Bay. Lynne Landwehr's HistoryinSLOCounty.org -- Just what it says it is. One of the best local historical sites!!! Morro Rock, Morro Bay, CA. 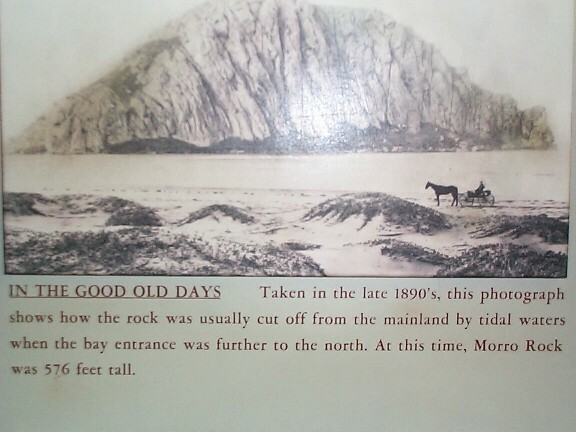 What did it Look Like between the Mainland and the Rock from the Late 1800's until Today? Further discussion (re-iteration) of Unamuno's reported 1587 landing. 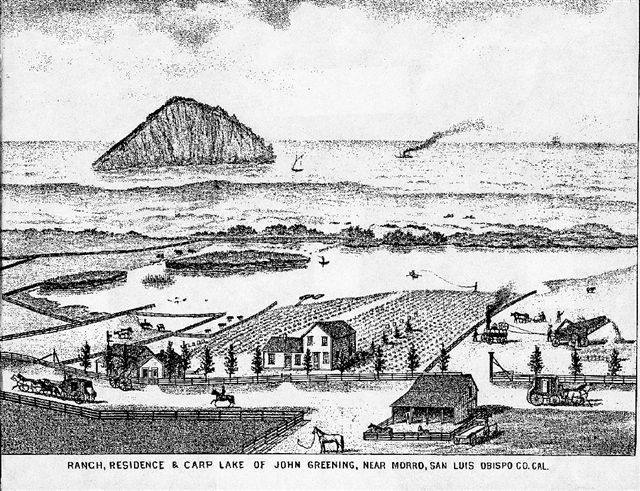 These show a drawing of John Greening's Carp Lake (also known as Greening Lake and Green Lake) north of Morro Rock (from the area known today as The Cloisters subdivision) in the 1800's, and an aerial view of Morro Rock where a rail trestle to the rock connects the rock to the land.